Sales & Marketing for Professional Services & Strategic IssuesWhy Dirty Harry wouldn't win a Gold Medal	Best Practice Advice & Compliance & Sales & Marketing for Professional ServicesConsider the context! by Tony Vidler. I have no idea what the actual statistics would be, but I am willing to wager that the success rate of popping the question “will you marry me?” onto a prospective partner who you have not yet dated is probably pretty low. If you’ve dated for a bit, the odds get a bit better, though only marginally so. If you’ve been engaged for a while and everyone knows what the end game is, then the odds are pretty good that you will get a “yes” to “will you marry me?”. How does this apply to financial advice? Well…the biggest problem with financial adviser marketing is the tendency to pop the “will you marry me” question to people who haven’t decided yet whether they want to spend a Saturday night with you. Before answering this question though it is important to understand a more fundamental question: What is the difference between marketing and selling? Many advisers seem to think that these are one and the same thing. Or, if pressed a little further, “marketing” is often confused with “advertising”. Marketing does include advertising… as it also includes having a clear value proposition, understanding the target market, the branding of the individual and the branding of the business entity, and a number of other things. Thinking bigger picture though; marketing is really about creating opportunities to gain a client or some new business. Selling is the process of converting that opportunity into an actual piece of business that your accountant can see. To answer the question posed at the outset then, one has to understand that while there may be many components that go into creating really effective marketing, the underlying question that the adviser is really asking is “how can I create more opportunities to engage with people who would be willing to take the actions I would recommend”? The part that really matters in this underlying question is “opportunities to engage with people“. 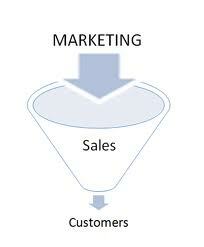 THAT is the piece that you must concentrate upon to create “more effective” marketing. This revelation is the point where advisers often say “aha, I get it” and their marketing efforts lift as they begin to focus upon creating new opportunities to generate future new business. It makes sense to them that if they are able to attract attention, and engage with people, then they begin to establish a relationship of trust. Surely having done this the prospective client will take my advice and work with me? It is at this point though that the bulk of such marketing efforts fall down in a heap. The reason? Lack of patience and understanding of the engagement process. It’s akin to having a couple of Saturday night dates and then wondering why the dream date doesn’t want to marry you yet. A lot of adviser businesses at this point are creating a lot of Saturday night dates….but there’s no follow through. It’s just lifting the initial activity level really. Engagement (in this business sense) is really about inter-acting with people on a regular basis in a way that they feel comfortable with until they decide they want to be with you. Your marketing purpose is to get, and then hold, their attention and build their level of interest in what you have to offer in the way of valuable advice and solutions. At some point in the engagement process you – or more likely some other event unrelated to your marketing and positioning – will trigger “desire” on their part to act. That is when the marketing process is finished, and selling begins. Although, if your marketing and engagement process is done well, the reality is that there is very little selling involved. The necessary level of trust and credibility in you as the right adviser has already been established. The rest is process and technical competency being applied to the clients’ need. The reality for a financial adviser business though is that engagement is forever. The actual marriage part – your client buying you or your solution at some point – is actually just a moment in time. It is a purchase. A transaction. A fait accompli….if the engagement was a fulfilling one. Engagement with clients, for the successful advice business, is long term. Once you have them as clients, then the engagement and ongoing interaction becomes even more important, as they can add significant value to your business if you can move them from supporting you to the point where they are advocates for your business. To make your marketing more effective – to get better results for your business – stop asking the marriage question. It’s not about the big moment and the big “sale”. Build systems and processes to engage people in a way they feel comfortable with, and share information and insights, and help them help themselves…..and they will want to take it further! Tony on Google+ © 2012 Tony Vidler. All rights reserved. All materials contained on this web site not otherwise subject to copyright of other parties are subject to the ownership rights of Tony Vidler. Tony Vidler authorises you to make a single copy of the content herein for your own personal, non-commercial, use while visiting the site. You agree that any copy made must include the Tony Vidler copyright notice in full. No other permission is granted to you to print, copy, reproduce, distribute, transmit, upload, download, store, display in public, alter, or modify the content contained on this web site.